ORCID iD	National Technical University of Ukraine "Kyiv Polytechnic Institute"
There are compared six noise suppression algorithms with application of objective factors of the speech signal quality, and also with application of through quality factor of the system of automated speech recognition in form of speech recognition accuracy. It is shown that radical noise suppression algorithms are worse than traditional noise suppression algorithms by both restored speech quality and speech recognition accuracy due to essential signal distortion. BENESTY, J.; CHEN, J.; HUANG, Y.; COHEN, I. Noise Reduction in Speech Processing. Berlin–Heidelberg: Springer-Verlag, 2009. EPHRAIM, Y.; MALAH, D. Speech enhancement using a minimum-mean square error short-time spectral amplitude estimator. IEEE Trans. Acoust., Speech, Signal Process., Dec. 1984, v.32, n.6, p.1109-1121, DOI: http://dx.doi.org/10.1109/TASSP.1984.1164453. EPHRAIM, Y.; MALAH, D. Speech enhancement using a minimum mean-square error log-spectral amplitude estimator. IEEE Trans. Acoust., Speech, Signal Process., Apr. 1985, v.33, n.2, p.443-445, DOI: http://dx.doi.org/10.1109/TASSP.1985.1164550. BROOKS, M. VOICEBOX: Speech Processing Toolbox for MATLAB. Imperial College London, Electrical Engineering Department, http://www.ee.ic.ac.uk/hp/staff/dmb/voicebox/voicebox.html. PLAPOUS, C.; MARRO, C.; MAUUARY, L.; SCALART, P. A two-step noise reduction technique. Proc. of IEEE Int. Conf. on Acoustics, Speech and Signal Processing, ICASSP, 17-21 May 2004. IEEE, 2004, v.1, p.289-292, DOI: http://dx.doi.org/10.1109/ICASSP.2004.1325979. PLAPOUS, C.; MARRO, C.; SCALART, P. Improved signal-to-noise ratio estimation for speech enhancement. IEEE Trans. Audio, Speech, Language Process., Nov. 2006, v.14, n.6, p.2098-2108, DOI: http://dx.doi.org/10.1109/TASL.2006.872621. HU, Y.; LOIZOU, PHILIPOS C. Evaluation of objective quality measures for speech enhancement. IEEE Trans. Audio, Speech, Language Process., Jan. 2008, v.16, n.1, p.229-238, DOI: http://dx.doi.org/10.1109/TASL.2007.911054. MA, JIANFEN; HU, YI; LOIZOU, PHILIPOS C. Objective measures for predicting speech intelligibility in noisy conditions based on new band-importance functions. J. Acoust. Soc. Am., May 2009, v.125, n.5, p.3387-3405, DOI: http://dx.doi.org/10.1121/1.3097493. YOUNG, S.; EVERMANN, G.; GALES, M.; ET AL. The HTK Book. Cambridge: University Engineering Department, 2009. 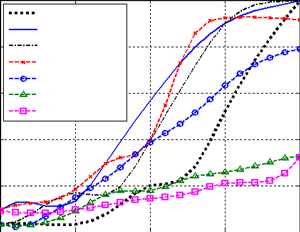 ELLIS, D. PLP and RASTA (and MFCC, and inversion) in Matlab, http://www.ee.columbia.edu/~dpwe/resources/matlab/rastamat/. Recommendation P.862 (2001) Amendment 2 (11/05), http://www.itu.int/rec/T-REC-P.862-200511-I!Amd2/en. PRODEUS, A. Calculation of Speech Recognition Quality Factor WB-PESQ in MATLAB. Proc. of 14th Int. Theoretical and Practical Conf. on New Network Technologies in Ukraine, 17-19 Sept. 2012, Partenit. Kyiv: Science issue Vesnik UNIIS, 2012, p.70-76.